Amateur champion Alan Dunbar, pictured with his fellow GB & I St Andrews Trophy squad member at Portmarnock last week. Picture by Patrick Bolger.Recently-crowned British Amateur champion Alan Dunbar will never forget the first time he met Great Britain and Ireland skipper Nigel Edwards. The Welshman literally jumped out on the Rathmore star in a local hotel during the 2008 Home International matches at Muirfield, where he made his international debut and Ireland won the trophy for the first time in five years. It was a case of mistaken identity for Edwards, who thought he was exacting revenge on team mate for a previous prank. “I was running up the stairs because we were late for dinner,” recalled Edwards, who will captain Great Britain and Ireland for the St Andrews Trophy encounter with the Continent of Europe at Portmarnock at the end of August - an event which will be run concurrently with the boys match for the Jacques Leglise Trophy. Dunbar, on the other hand, has never really surprised Edwards with his play and while he’s certain to make himself available for the St Andrews Trophy from August 31 to September 1, Portrush’s latest world star doesn’t rule out a second Walker Cup appearance in New York next year. If he is available, it will almost certainly mean that he has failed to come through this autumn’s European Tour Qualifying School, which he plans to enter as an amateur. And while Edwards will be pulling for Dunbar at Q-School and accepts that he will fly the nest sooner rather than later, he makes no secret of the fact that he’d like the 22-year old to stick around in the amateur ranks for a while longer. “We all knew that Alan was going to Q-School in September as an amateur and who am to decide whether he should or shouldn’t go,” Edwards said during a three-day St Andrews Trophy squad session at Portmarnock last week. “What I would say is that if you have playing status, then I could understand [turning professional]. It’s when you haven’t got playing status that the decision to turn pro becomes tough. Edwards was criticised for picking a somewhat out-of-sorts Dunbar for last year’s Walker Cup at Royal Aberdeen but had his faith in a man he describes as a “big time player” repaid in spades. “In my mind, Alan was never not in my team,” Edwards said. “So it wasn’t a big issue for me. I had a lot of faith in his ability and I told him that. The St Andrews Trophy“When you are picking a team you are not just considering somebody’s performance in one event, you are picking somebody who you feel can deal with the big situation, who has been a winner and also how he fits into the team. He was a natural fit for Paul Cutler, so that makes it a lot easier for me. “There were a lot of other natural fits in those foursomes pairings and one in particular that people probably didn’t think about. I saw a blend in another pairing - Rhys Pugh and James Byrne. Most people see a Scot going with a Scot, an Irishman with an Irishman, English with English. As it turned out, Edwards’ team selection was inspired. Naturally, after those Walker Cup winning heroics, it was no surprise then to Edwards to see Dunbar lift the Amateur Championship at Royal Troon two weeks ago. “Alan did great at Troon and managed to scrape his way through into the qualifying and then went on and won,” Edwards said, grinning at the youngsgter sitting next to him in one of Portmarnock’s grand dining rooms. “And I was absolutely delighted for him because he performed with distinction at last year’s Walker Cup. “He has done great. I went to the Irish golf awards last year and I was asking him about his preparations for the forthcoming season and why he turned down [a trip with the GUI to] Australia and with hindsight it was obviously a great decision. “But I thought he was acting in a manner that would benefit him long term instead of short term gain of going down to Australia. Those opportunities will be there. “He is going to have a very long career and we were chatting yesterday. He has put in a lot of hard graft and he is reaping the rewards now. It is not just the Amateur Championship that he won, he performed with distinction at the [St Andrews] Links Trophy as well. Dunbar has decided not to take up an invitation to play in this week’s Scottish Open on the European Tour following a hectic month on the course. He’s simply trying to let his recent success sink in and make plans for the future. And while the Northern Ireland star plans to remain amateur when trying for his tour card and must remain amateur if he wants to take up invitations to play in next year’s Masters and US Open, he knows it’s too early to make predictions. European Tour regulations would allow him to win his card as an amateur and wait six months before taking it up as a professional, effectively allowing him to play in the Masters. “I have been told about that but let’s wait and see if we have that decision to make,” Dunbar said. It’s all about improving and Dunbar plans to continue his work with coach Seamus Duffy, which is what set up such a stellar year in the first place. He loves the amateur scene even more since last year’s historic Walker Cup victory over a very strong American side. “The Walker Cup last year, I think back on it and it’s something I will never forget,” Dunbar said. “It definitely gave me a lot of confidence to do what I did this year. Making the team was great but I knew I had to make improvements if I wanted to keep going. Asked if he had felt under pressure to justify his Walker Cup selection, Dunbar shook his head. “I don’t think I had anything to prove. I obviously feel I earned my spot on the team and was there to earn points for the team. I knew I needed to get better and I know I have to keep getting better. Amateur golf is his domain for now and anyone with an interest in the stars of the future should make their way to Portmarnock from August 31 to September 1 to check out some prodigious talent. The sixteen-man squad played foursomes and singles matches over three days with Edwards commenting: “This final session for the entire squad is a key part of our team selection process and selectors will be making their judgments on individual scoring and the ability to perform as part of an international team. In recent St Andrews Trophy Matches GB&I has been represented by leading players at the peak of their amateur careers including, Paul Casey (2000), Luke Donald (2000), Rory McIlroy (2006) and Tom Lewis (2010). Similarly, the Continent of Europe has been represented by, Mikko Illonen (2000), Martin Kaymer (2004) and Edoardo and Francesco Molinari (2004). The overall St Andrews Trophy Match first contested at Wentworth in 1956 is scored 24 - 4 in GB&I’s favour but at the last playing in 2010 at Golf Club Castelconturbia in Milan, Italy, Continent of Europe were the victors, 14 -10. The GB&I squad includes four Irish players, The Amateur Champion, Alan Dunbar (Rathmore), Dermot McElroy (Ballymena), Richard O’Donovan (Lucan) and Kevin Phelan (Waterford Castle), eight Englishmen, Craig Hinton (The Oxfordshire), Ben Loughrey (Wrag Barn), Garrick Porteous (Bamburgh Castle), Neil Raymond (Corhampton), Callum Shinkwin (Moor Park), Ben Stow (Rushmore), Ben Taylor (Walton Heath) and Josh White (Chipstead), two Welshmen, Rhys Pugh (Vale of Glamorgan) and Jason Shufflebotham (Prestatyn) and two Scots, Paul Shields (Kirkhill) and James White (Lundin). The Portmarnock Club has hosted the St Andrews Trophy Match on one previous occasion in 1968 when GB&I triumphed, 20 -10 with Joe Carr and Tom Craddock in the side. Greystones’ Paul DunneIrish trio Paul Cutler, Alan Dunbar and Paul Dunne have been included in a preliminary Great Britain & Ireland squad for this year’s St Andrews Trophy Match at Golf Club Castelconturbia, Italy, on 27 & 28 August. Two years ago, Dermot McElroy was at Portmarnock Golf Club to take part in the Darren Clarke Foundation coaching weekend. Now he’s in the Great Britain & Ireland St Andrews Trophy squad battling to return to the north Dublin links for this summer’s clash with the Continent of Europe. Dermot McElroy, Kevin Phelan and Alan Dunbar have been named in a preliminary 12-man Great Britain & Ireland St Andrews Trophy training squad for this year’s clash with the Continent of Europe at Portmarnock from 31 August and 1 September. 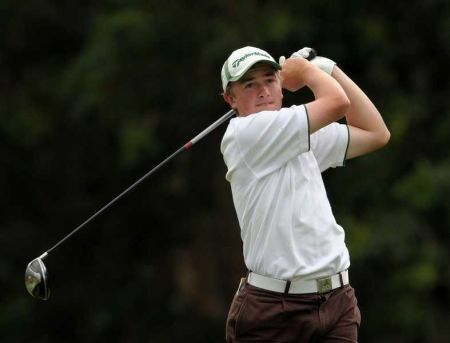 Alan Dunbar, 22, hails from Rathmore, Northern Ireland, the same club that spawned 2010 US Open champion, Graeme McDowell. He comes into the St Andrews Trophy as the holder of The Amateur Championship having beaten Austria’s Matthias Schwab on the 36th hole of this year’s final at Royal Troon. Nigel Edwards watches GB&I’s Garrick Porteous hit his tee shot at the 7th in the singles.Waterford Castle’s Kevin Phelan produced a sensational short game magic to grab a crucial singles win and help Great Britain and Ireland take a 7-5 lead over the Continent of Europe into the final day of the St Andrews Trophy at Portmarnock. The same could be said for the balance of power in Europe after the Continent of Europe claimed both the St Andrews Trophy and the Jacques Léglise Trophy on a day when the winds of change blew ominously for British and Irish golf at a magnificent Portmarnock.